Having said that yoga is not about asana alone and pranayama, yoga is a way of life. Good health depends on the long-term commitment and the foundation for that needs to be built on four important pillars. According to the World Health Organization (WHO), health is state of physical, mental and social well being. AHAR means food. “Annam Brahma—means the food is Brahman (Lord of creation). There is an old adage which says, “As the food so the mind, As the mind so the Man”. This saying depends on what you eat, how you eat and when you eat. Every bite you put in your mouth counts for your well being and lifespan, but this does not mean you start binge eating. Eating in moderation is key to maintain a healthy life. Rajasic food creates a restless state of mind. These foods are difficult to digest like non-veg, non-sprouted beans and pulses, garlic, onion, unseasonal veggies and salt. Tamasic food creates a lethargic state of mind. This includes food which is stale or cooked over a long period. All refined, processed, artificial flavoured foods, deep-frozen foods, pickles, jams, beverages, deep-fried foods, liquor, tobacco, drugs. The ancient literature says, “One should break one’s night long fast at the time of sunrise and end ones last meal at the time of sunset”. Going by what our ancient literature says, we all know BREAKFAST should be our first meal and that should be king sized. Whatever, we eat in the morning is absorbed and assimilated to the maximum. Food taken during the lunch should be easily digestible and dinner should be the lightest meal of the day. When you eat food. Your state of mind will decide how food is going to be utilised by the body. Eat your meals with full concentration. Chew your food well and enjoy the subtle taste of each food items. Most important avoid using mobile or watch TV while eating food. Vihar means recreation. The literal meaning is moving or walking. Stress is a common factor these days. Everybody is stressed on a day to day basis and the reasons for stress can vary and spend time with oneself is a big task. Recreation, relaxation and enjoying family time rejuvenates the body and mind. It’s a kind of anti-depressant for us. Spending some time in activities which you enjoy clears off mind, relieves depression and anxiety, elevates your mood and gives a feeling of well being. Active creative hobbies like gardening, painting, playing musical instruments engage all sensory organs and releases pent-up emotions and recharges the mind. Playing sports is another way of relaxing body and mind. Relaxation is the cornerstone of well-balanced personality. Maintain the relaxed attitude throughout the day. Relaxation is an art which needs to be cultivated. It is important for our body, emotions and our nervous system. Regular exercise or relaxation keeps you fit and keeps disorders at bay. How often is it that your day goes unplanned and you get hassled with too much work in the day? 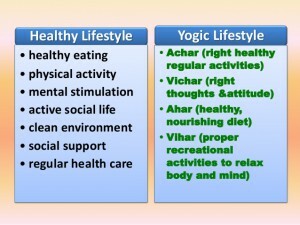 Our mental health and being are dependent on better routines (achaar). Regularity and sincerity are two major components of a good routine. The best example of following a routine is the SUN-It rises and sets daily without any excuse. Our intellectual health is rightly dependent on how we think. Our thoughts are food for our mind. Buddha says, “Based on your thinking you become the person you are”. If you think you are weak, you will be weak. If you think you are strong, you will be strong. Manage your thought process correctly. Always develop a good attitude and enlarge your vision. Good thoughts process can be added in daily life by reading good books, scriptures, attending Satsang (religious discourses), reciting holy mantras, observing rituals, recollecting good experiences and thinking positive in all situations. So let me share a quick small recipe for happiness with you. If you add this in your life this might add spark to your life. Add faith and mix well. Serve smilingly to everyone you meet to spread happiness. Have a healthy, Happy life ahead! Western world still has a lot to learn from the ancient Ayurvedic wisdom.